M & M Test & Balance of Florida Inc.
HVAC test adjust and balance is important to insure that small to large systems are flowing as per design specifications. This helps control humidity, obtain optimal comfort and minimize costs. No matter what type of air conditioning system you own you can benefit from having a Test, Adjust and Balance of the system performed by certified professionals at M&M Test and Balance of Florida, Inc.
A computerized HVAC Control system is used for climate control in commercial buildings and may be pneumatic or electronic. 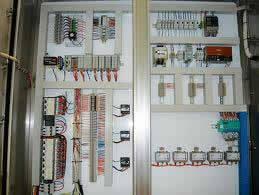 Often, these controls will include fire, security, and lighting controls into one system. These systems typically use one or more central controllers to command and monitor the remote terminal unit controllers They in turn communicate with one or more personal computers that are used as the operator interface. These control systems are typically used on large commercial and industrial buildings to allow central control of many HVAC units around the building(s). Both direct digital controls and building automation systems are programmable and easily customizable. Features include time, schedules, controllers, logic, setpoints, alarms etc. If the building owner wants more control over the cooling and heating units than a Building Automation System (BAS) can be used to interface with more complex HVAC systems. This allows the building owner to be able to monitor the system and respond to alarms generated by the system from local or remote locations. 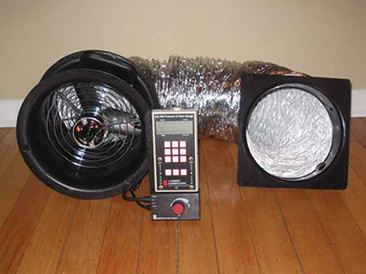 Duct leakage is a key component in identifying energy losses from forced air cooling and heating systems. Duct Leakage Testing is preformed by sealing off a section of duct and a test fan is blown at one end to provide the necessary test pressure as leakage is measured. 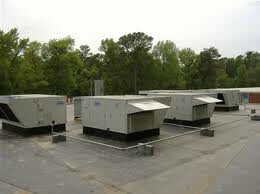 This testing can tell you how much leakage your duct system has and therefore how much energy and money you are losing. 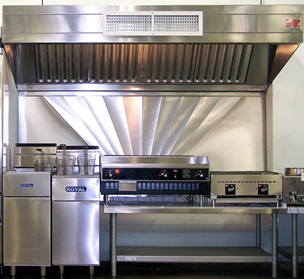 There are 3 primary components to a commercial kitchen exhaust hood. The hood canopy itself takes in vapors and fumes from cooking. Theses fumes are collected and moved through the blowing system while the duct system allows the fumes to be removed and replaced with clean air. This type of ventilation system is used in professional kitchens to remove the fumes, vapors, or smoke created while cooking. Oxygen is replenished and polllutants are diluted when the Inside air is replaced with outside air. Kitchen exhaust hoods can keep a kitchen clean and comfortable and is as important as the cooking equipment itself especially in a commerical environment such as restaurants. Copyright © 2011-2018 M & M Test & Balance of Florida Inc. All Rights Reserved.